Battleship Potemkim, directed by the legendary Sergei Eisenstein, re-tells the story of the mutiny of the titular boat back in the days of Russian Tsars. When the sailors of the Potemkim have had enough of their harsh conditions, they decide to revolt. However, the leader of the group was killed, and the rest of the crew decide display his body in public to honor him and to quell up people to join them. To say Battleship Potemkim is a famous film is like saying the Pope is Catholic. People will respond with ‘duh’ and judge your mental status if you think otherwise. It has been engraved in film history for so long that parodies and tributes of it are probably more publicly known than the film itself. I am talking of course about the Odessa steps scene. You know, pram rolling down stairs? With such fame comes the inevitable fear that the movie as a whole would not live up to it’s name. Thankfully, Battleship Potemkim does not fall down that route, as the film is quite an enjoyable watch. Aleksandr Antonov as Grigory Vakulinchuk is our main character for the first half of the movie. He is the one that starts this whole chain reaction. He, along with the rest of the actors/sailors, bring a very strong and dramatic performance, building up the ultimate revolt masterfully. And damn did they have beautiful mustaches. While the Odessa Steps scene is usually singled out from the movie, the whole film is actually edited very well. Eisenstein’s theory of montage is used to full effect and results in a thrilling and engaging movie. Quick cuts of expressing faces and the motion of the bodies are used with great results. Overall, Battleship Potemkim is a film that will last the ages, for its contributions to cinema will be forever and everlasting. It might not catch the eye of today’s youth due to it’s age, but it’s a must watch to those that want to see apart of film history. 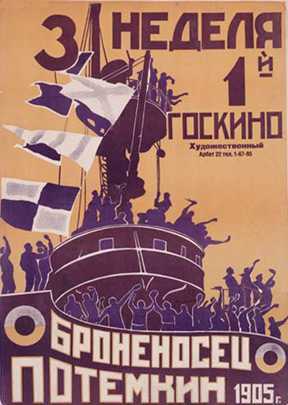 This entry was posted in Film, Movie, Review and tagged 1925, Battleship Potemkim, Sergei Eisenstein.